Editorial: How Is Consensus Established? The Implant-Abutment-Soft Tissue Interface: Change Is Hard! Purpose: The aim of this study was to evaluate the microgap between the abutment and implant as well as the circularity of implant platforms and associating conformational errors with bacterial microleakage in tapered connection implant systems. Materials and Methods: Four brands of implants with a tapered abutment connection were tested. Bacterial leakage was assessed using 0.3 μL of Escherichia coli suspension inoculated into the abutment screw chamber of the implants, which were then torqued and incubated at 37°C for 14 days. All specimens used for the microbiologic experiment were then cut lengthwise, and the microgap was measured at three points on each side of the sample using scanning electron microscopy (up to 5,000× magnification). Microtomography was used to assess implant platform circularity to validate the microscopic findings qualitatively. Results: Two samples from the Nobel Biocare system, four from the Ankylos (Dentsply) system, four from the Neodent (Straumann) system, and five from the Conexão system were positive for bacterial leakage, with no significant difference between groups. The Neodent system had the highest mean microgap values (5.84 ± 9.83 μm), followed by the Nobel Biocare systems (5.17 ± 4.10 μm), Ankylos (3.47 ± 3.28 μm), and Conexão (2.72 ± 3.19 μm), with no significant difference between systems. All systems showed conformational errors of circularity on microtomography images. Conclusion: The tapered connection systems evaluated herein were not able to halt bacterial leakage, nor were they free from conformational errors. Purpose: The objective of this investigation was to assess vertical bone augmentation using deproteinized bovine bone mineral (DBBM) infused or not with recombinant human bone morphogenetic protein (rhBMP-2) in rabbit tibiae. Materials and Methods: A total of 18 female rabbits (New Zealand) received two blocks of DBBM in each tibia. The DBBM blocks were randomly assigned into four experimental groups: DBBM (only the bone graft); DBBM associated with absorbable collagen sponge (ACS); DBBM plus rhBMP-2 (1.5 mg/mL); and DBBM infused with rhBMP-2 (1.5 mg/mL) in an ACS carrier. Animals were sacrificed after 12 weeks, and the tibiae containing the DBBM blocks were dissected and analyzed radiographically (microcomputed tomography [micro-CT]), histologically, and immunohistochemically. Results: Micro-CT analysis showed a considerable increase in bone volume (BV) and BV/tissue volume in the rhBMP-2/ACS group compared with all the others. Trabeculae thickness also increased in the rhBMP-2/ACS group compared with the DBBM/ACS group. Trabecular number, separation, and bone mineral density were not different among groups. Histomorphometric evaluation showed increased newly formed bone in the rhBMP-2/ACS group compared with the DBBM and DBBM/ACS groups. The amount of residual bone graft was statistically higher in the rhBMP-2 groups compared with the DBBM/ACS group. Immunohistochemical analysis showed that the vascular endothelial growth factor (VEGF) expression was more intense in the rhBMP-2/ACS group compared with the DBBM/ACS group. The immunopositivity for type 1 collagen tended to be higher in the two groups with rhBMP-2. Conclusion: Collectively, the results of this study suggest that the addition of rhBMP-2 in an ACS carrier placed on top of the DBBM graft enhanced bone formation in this animal model. Purpose: The purpose of this study was to investigate the effect of resin cement type on the retentive strength of custom zirconia abutments bonded to titanium inserts. Materials and Methods: Sixty implant (4.3 mm diameter and 11.5 mm length) and custom zirconia abutment (15 mm height and 2 mm wall thickness) pairs were used to form six groups (n = 10 each). Three different resin cements were used to bond the zirconia abutments and titanium inserts: Panavia F 2.0, Zirconite, and Multilink Hybrid Abutment. Control groups and thermomechanically aged groups were formed. Specimens were subjected to tensile test to failure, and the retention values were analyzed by two-way analysis of variance (ANOVA). Results: Two-way ANOVA showed a significant effect of the cement type and thermomechanical aging (P < .05). Regardless of the cement, control groups showed significantly (P < .05) higher retentive strength than the thermomechanically aged groups. Comparing the resin cements, the retentive strength of Zirconite, aged or not, was higher than that of Panavia F 2.0 and Multilink Hybrid Abutment; no significant differences between the latter two cements were found. In the Zirconite group, adhesive failure occurred mostly between the titanium and the resin cement. In the Panavia F 2.0 and Multilink Hybrid Abutment groups, adhesive failure between the zirconia and the resin cement was observed. Conclusion: Resin cement type had an effect on the retentive strength of custom zirconia abutments bonded to titanium inserts. Thermomechanical aging had a negative effect on the retentive strength. Zirconite adhesively bonded to the zirconia surface of the custom abutment. Differences were noted in adhesive failure types among the cements. Arce, Celin / Lawson, Nathaniel C. / Liu, Perng-Ru / Lin, Chee Paul / Givan, Daniel A. Purpose: Screw-retained zirconia implant crowns with an internal titanium base have favorable mechanical properties compared with single-piece zirconia implant crowns; however, the screw-retained implant crowns require adequate bonding between the zirconia crown and the titanium base. This study measured the retention between a titanium base and a full-contour zirconia implant crown following different surface treatments of their bonded surfaces. Materials and Methods: Full-contour screw-retained zirconia implant crowns were fabricated to fit a titanium base. The crowns were bonded to the titanium bases following one of four treatment protocols (n = 15 per protocol group): no surface treatment (Control), 10-methacryloyloxydecyl dihydrogen phosphate (MDP) primer on the intaglio of crown and exterior of base (MDP), alumina airborne-particle abrasion of the intaglio of crown and exterior of base (Alu), and alumina airborne-particle abrasion and an MDP primer on the intaglio of crown and exterior of base (Alu+MDP). All crowns were bonded to the base with resin cement. Specimens were stored in water for 24 hours at 37°C and then thermocycled in water, with a temperature range of 5°C to 55°C, for 15,000 cycles with a 15-second dwell time. Crowns were separated from the titanium bases using a universal testing machine. The four treatment protocols were compared using one-way analysis of variance (ANOVA), followed by Tukey post hoc tests (P < .05). Sectioned specimens were examined with scanning electron microscopy (SEM). Results: Retention forces for Control (737.8 ± 148.9 N) and MDP (804.1 ± 114.5 N) were significantly greater than Alu+MDP (595.5 ± 122.2 N), which was significantly greater than Alu (428.2 ± 93.8 N). Visual inspection of the debonded specimens showed that the majority of the cement remnants were seen on the external surface of the titanium bases. Microscopic examination of the interface between the crown and the unaltered base shows that the cement gap is approximately 13 μm at the crest of the microgrooves and 50 μm within the channel of the microgrooves. After airborne-particle abrasion, the microgrooves became significantly dulled, and the cement gap increased to 27 to 40 μm at the crest and 55 to 58 μm in the channels. Conclusion: Airborne-particle abrasion of titanium bases that contain retentive microgrooves prior to bonding is contraindicated. Application of an MDP primer demonstrated limited improvement in the retention of the zirconia implant crowns. Purpose: To study the force used for tightening tapered one-piece prosthetic abutments and their influence on the removal torque value and stress level of the prosthetic abutment after cyclic loading. Materials and Methods: Fourteen implants and prosthetic abutments were divided into two groups (n = 7): G1, 20 Ncm; and G2, 32 Ncm (manufacturer recommended). A 20-mm T-shaped horizontal bar was adapted to the abutments. A 12-Hz cyclic loading was applied to the specimens in an electrodynamic testing system with the maximum number of cycles set to 106. Specimens were inclined by 15 degrees from the vertical axis, and a 5-mm off-center vertical load was applied to generate a combination of bending and torquing moments on the tapered connections. Progressive loads (from 164.85 to 362.85 N) were applied when the previous sample survived 106 cycles. The paired t test compared the screw removal torque with the initial tightening torque for each group (α = .05). A finite element analysis (FEA) of the mechanical testing analyzed the regions of stress concentration. Results: No specimens failed after 106 cyclic loadings. The mean screw removal torque for both groups was similar to the initial abutment torque value applied for each group (G1, 20.36 ± 8.73 Ncm; and G2, 35.61 ± 6.99 Ncm) (P > .05). FEA showed similar stress behavior for both groups in the study despite the different simulated screw preloads (G1: 200 N; G2: 320 N). The coronal region of the implant body presented the highest strain values in both groups. Conclusion: Tightening tapered one-piece prosthetic abutments at 20 and 32 Ncm maintains a stable connection after cyclic loading. The stresses generated by the different tightening forces during cyclic loading are highest at the coronal level of the connection. Purpose: Bio-Oss and demineralized freeze-dried bone allograft (DFDBA) are two commercial bone grafts that have been associated with clinical success for many years. However, there are few in vivo studies regarding their healing mechanism. The purpose of this study was to investigate the level of bone formation using microcomputed tomography (micro-CT) and gene expression in mouse calvaria at 1 and 3 months after bone grafting with deproteinized bovine bone and freeze-dried human bone, and compare them to natural bone healing. Materials and Methods: Thirty-six mice were divided into three groups (n = 6 per group) according to the type of bone graft used: group 1 (control)-an empty defect without bone graft; group 2- treatment with deproteinized bovine xenograft (Bio-Oss); group 3-treatment with DFDBA. The bone graft was inserted into two 3-mm calvarial defects created on both sides of the parietal bone. At 1 and 3 months, the mice were sacrificed and bone volume was evaluated using micro-CT and gene expression analysis using reverse transcription polymerase chain reaction (RT-PCR). Results: Micro-CT analysis demonstrated that the parietal bone of mice grafted with Bio-Oss had significantly greater bone volume than both the DFDBA and control groups at both 1 and 3 months. The expression of bone marker genes (Runx2, Osterix [Osx], alkaline phosphatase [ALP], osteopontin [OPN], and osteocalcin [OCN]) were significantly increased from 1 month in both Bio-Oss and DFDBA groups at 3 months. Runx2 and Osx had significantly higher expression in the Bio-Oss and DFDBA groups compared to the control group at 3 months. No statistically significant difference was observed among groups after 1 month. Conclusion: These results showed that both bone graft materials promoted bone regeneration. Bio-Oss demonstrated high osteoconductive properties. 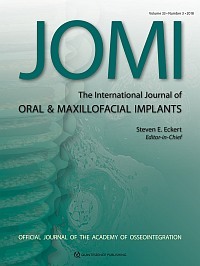 Purpose: The aim of this study was to evaluate the clinical outcomes of vertical distraction osteogenesis (VDO) for patients with vertically deficient alveolar ridges in terms of (1) the cumulative implant survival rate, (2) bone gain, (3) bone resorption before and after implant insertion, and (4) complications. Materials and Methods: An electronic search was conducted via MEDLINE (PubMed), EMBASE, and the Cochrane Library, complemented by manual searches, to identify eligible clinical studies of VDO before dental implantation. Two reviewers independently performed the study selection and data extraction. The implant survival rate, mean bone gain, and bone resorption amount, with 95% confidence intervals (CIs), were pooled separately. A random-effects model or fixed-effects model was chosen based on the heterogeneity. A funnel plot and Egger's test were performed to identify publication bias. Results: Of the 4,391 records after removal of duplicates, 113 full-text articles were obtained for further analysis, and 12 articles were ultimately included in the analysis. Two studies were defined as low quality. The estimated cumulative implant survival rate was 98.00% (95% CI: 96.02% to 99.40%), with a mean follow-up of 3.52 years. The bone gain was 7.92 mm (95% CI: 6.27 to 9.57 mm), with a range from 4 to 20 mm, and the level of bone relapse between the end of the distraction and the implant insertion was 0.97 mm (95% CI: 0.68 to 1.26 mm). The complication rate was high, with rates of 0.728 per site and 0.821 per patient. The most common major complication was basal bone fracture, with a rate of 2.27%, and the most common minor complication was displacement of the transport segments, with a rate of 16.71%. Conclusion: Vertical alveolar defects could be rehabilitated successfully with distraction osteogenesis, and the implant placed in the distraction sites showed a high cumulative survival rate. However, the high complication rate necessitates caution. Due to the observed heterogeneity, the results of this meta-analysis should be interpreted with caution. Purpose: To evaluate the gene expression levels of semaphorins 3A, 3B, 4A, and 4D in both healthy and diseased implants. Materials and Methods: Subjects with peri-implantitis presented clinical attachment loss, probing depth ≥ 5 mm, bleeding on probing and/or suppuration, and radiographic bone loss > 4 mm. Peri-implant tissue biopsy specimens were sampled for analysis of the mRNA expression levels for semaphorins 3A, 3B, 4A, and 4D. A real-time polymerase chain reaction was performed, and the gene expression levels of semaphorins in relation to the housekeeping gene were analyzed by using the nonparametric Mann-Whitney test (P < .05). Results: Thirty-five subjects (16 men, 19 women; mean age: 54.12 ± 2.34 years) with implant-supported restorations, using screw-shaped dental implants with internal or external hexagon were enrolled in this study. Higher levels of semaphorins 3A and 4D were detected in the peri-implantitis compared with the healthy tissues (P = .0011 and P = .0404, respectively), whereas Sem4A levels were significantly higher in the control group (P < .0001). Differences between groups in the expression levels of Sem3B were not significant. Conclusion: Advanced peri-implantitis lesions showed higher levels of gene expression for Sem3A and Sem4D and lower levels of Sem4A in comparison to tissues obtained from a healthy dental implant. Purpose: This research aimed to assess whether pink-shaded anodized surfaces could enhance the adhesion of soft tissue cells compared with untreated machined titanium surfaces. Materials and Methods: Two types of Ti-Al-V titanium samples were prepared: machined titanium (Ti) and anodized titanium (AnoTi). The microstructure was studied by means of a scanning electron microscope. X-ray photoelectron spectroscopy (XPS) was carried out as well. The wetting properties were investigated by the sessile drop technique with water and diiodomethane. To investigate the biologic response in vitro, the epithelial cell line HaCaT and the fibroblastic cell line NHDF were used. Cell adhesion, morphology, and proliferation were evaluated. Results: The microstructure of the tested surfaces was irregularly smooth for both types of samples with no relevant morphologic differences. The XPS and HR-XPS performed on the AnoTi samples confirmed the presence of Ti, O, and C, along with Ti oxides. Following the optical contact angle measurements, the anodization process induced a slight transition toward the hydrophobic regime. Consequently, the surface free energy values differed significantly between the anodized and the machined samples. Anodized Ti significantly increased the adhesion and proliferation of both epithelial cells and fibroblasts when compared with the pristine Ti controls. Conclusion: Compared with the clinical standard, anodized surfaces could enhance the adhesion of the two major cell types within the peri-implant soft tissues, which makes pink anodization a promising option for implant dentistry. Purpose: The objective of this systematic review was to compare the loss of marginal bone between implants with internal and external connections by analyzing results reported in studies published after 2010. Materials and Methods: A literature search in MEDLINE with the keywords "dental implant connections, external internal implant connection, bone loss implant designs, internal and external connection implant studies in humans" was conducted. Clinical trials on human beings, comparing both connections and published in English, from 2010 to 2016 were selected. Their methodologic quality was assessed using the Jadad scale. Results: From the initial search, 415 articles were obtained; 32 were chosen as potentially relevant based on their titles and abstracts. Among them, only 10 finally met the inclusion criteria. A total of 1,523 patients with 3,965 implants were analyzed. Six out of 10 studies observed that internal connections showed significantly less bone loss compared with external connections. The remaining four articles did not find statistically significant differences between the two connections. Conclusion: According to this systematic review and considering its limitation due to the degree of heterogeneity between the included studies, both internal and external connections present high survival rates. To assess whether marginal bone loss differs significantly between the two connections, more homogenous clinical studies are needed with identical implant characteristics, larger samples, and longer follow-up periods. Studies included in this review and characterized by long-term follow-ups showed that the external connection is a reliable connection on a long-term basis. Purpose: The purpose of this study was to evaluate the fit of additively manufactured cobalt-chromium and titanium and CNC-milled titanium frameworks before and after ceramic veneering. Materials and Methods: Ten stone casts simulating an edentulous maxilla provided with six abutment analogs were produced. For each stone cast, one additively manufactured cobalt-chromium framework (AM CoCr) and one titanium framework (AM Ti) were fabricated. The fit was analyzed with a coordinate measuring machine in three dimensions (x, y, and z axes) using best-fit virtual matching of center point coordinates, before and after ceramic veneering. CNC-milled titanium frameworks (CNC Ti) and earlier results from CNC-milled cobalt-chromium frameworks (CNC CoCr) were used for comparison. Results: All frameworks presented minor misfit before and after veneering in the horizontal plane (x- and y-axes) between 2.9 and 13.5 μm and in the vertical plane (z-axis) between 1.6 and 5.4 μm. Ceramic veneering affected the fit of all groups of frameworks. Both AM Ti and AM CoCr presented significantly smaller distortion in the vertical plane compared with the CNC-milled frameworks. Conclusion: Implant-supported frameworks can be produced in either Ti or CoCr using either CNC milling or additive manufacturing with a fit well within the range of 20 μm in the horizontal plane and 10 μm in the vertical plane. The fit of frameworks of both materials and production techniques are affected by the ceramic veneering procedure to a small extent. Purpose: In the context of macrostructural and microstructural modifications to the design of dental implants, surface topography changes with different treatments have the purpose of accelerating bone formation. The aim of this study was to evaluate in vitro the influence of aggregated hydroxyapatite nanocrystals to surfaces treated with double acid etching (Nano) on osteoblastic cell behavior compared with a conventional double acid-etched surface (DE). Materials and Methods: Commercially pure Grade 4 titanium discs (6 × 2 mm) were selected, and both cell proliferation and viability were assessed at 24, 48, and 72 hours using Trypan blue vital dye and MTT, respectively. The expression of type I collagen and osteopontin on such surfaces was evaluated using ELISA. Immunostaining for fibronectin was also performed. Quantitative data were analyzed statistically using two-way analysis of variance (ANOVA) followed by Bonferroni post-test with a 5% significance level. Results: The results showed that in all evaluated time periods, cells expressed fibronectin on both surfaces. The cells presented greater morphologic spreading on the Nano surface when compared with the conventional DE surface in all assessed times. Increased cell proliferation and viability were detected in the Nano surface (P < .05) when compared with the conventional DE surface, especially after 72 hours. Osteopontin expression was higher after 24 hours in the Nano surface when compared with the conventional DE surface (P < .05). For type I collagen, a higher expression was observed with the Nano surface than with the DE surface, again after 72 hours (P < .05). Conclusion: This in vitro study showed that the treated Nano surface tested promoted increased cell proliferation and viability when compared with the control surface. Additionally, increased cell spreading as well as type I collagen and osteopontin secretion were observed, favoring the early events of osseointegration. Purpose: To evaluate the influence of the use of avocado/soybean unsaponifiables (ASU) on osseointegration of implants in animals with experimental arthritis. Materials and Methods: One hundred twenty rats were randomly divided into four groups: CTR, healthy animals and saline solution administration; ASU, healthy animals and ASU administration; ART, arthritic animals and saline solution administration; and ART/ASU, arthritic animals and ASU administration. The solutions were administered daily by gavage, beginning 7 days before the surgical procedures until the completion of the experimental period (15, 30, and 60 days after the placement of the implants in the tibia). The osseointegration of the implants was evaluated by histometric analysis (bone-to-implant contact [% BIC], bone area between the threads [% BBT]) and biomechanical analysis. Microcomputed tomography (micro-CT) analysis was used to assess bone volume in the vicinity of the implant. Immunohistochemistry analysis was performed to assess the expression of osteocalcin and transforming growth factor beta 1 (TGF-β1). Results: The ART/ASU group showed a decreased percentage of bone in the area around the implant compared with the ASU and ART groups (15 and 30 days). The ART/ASU group showed increased removal torque values (30 days) and % BIC and % BBT (30 to 60 days) compared with the ART group. The ASU group had increased % BIC values compared with the ART and CTR groups (60 days). The CTR group had the highest expression of osteocalcin, while the ASU group presented the highest expression of TGF-β1 at 60 days. Conclusion: The ASU administration improved the osseointegration, particularly in animals with induced arthritis. Purpose: This systematic review aimed to identify the effects of certain flap management procedures on ridge preservation on the basis of existing literature. Materials and Methods: Electronic (MEDLINE, EMBASE, and Cochrane Central Register of controlled trials) and manual searches of the literature were conducted until February 2017. Randomized controlled trials (RCTs), controlled clinical trials (CCTs), and prospective cohort studies that involved at least 10 subjects were eligible for this systematic review. To evaluate the beneficial effects of flap management on ridge preservation, changes in the bone width, bone height, and keratinized gingiva width were calculated using a random effects model. Results: Eleven studies (nine RCTs and two CCTs) were included in this review. No statistically significant differences in bone width and height changes were identified between the flapped and flapless ridge preservation techniques and between the free gingival graft and flapless ridge preservation techniques. A statistically significant shrinkage in keratinized gingiva width was noted with flapped ridge preservation compared with flapless ridge preservation (weighted mean differences, −3.21 mm; 95% confidence interval, −4.10 to −2.33; P < .00001; heterogeneity, 51%; χ2, 0.15). Conclusion: Within the limitations, this review reveals that flapless ridge preservation was more effective in preserving bone width, bone height, and keratinized gingiva width. To present pertinent evidence regarding which flap management should be recommended for ridge preservation, more controlled and high-quality studies are warranted. Purpose: Owing to volumetric changes after tooth extraction, lateral ridge augmentation has become a common procedure prior or simultaneous to implant placement. Nonetheless, little is known with regard to the dimensional remodeling after healing of these lateral ridge augmentation procedures. Hence, the purpose of this systematic review was to assess the stability of bone grafting material between augmentation procedures and final healing, in terms of resorption rate. Materials and Methods: An electronic and hand literature search was conducted in several databases, such as the Cochrane Oral Health Group Trials Register, Embase, and Cochrane Central Register of Controlled Trials, up until February 2017. Only randomized controlled trials (RCTs) with a mean follow-up of at least 6 months after implant placement aiming to evaluate the stability of grafting material for lateral ridge augmentation were included and quantitatively analyzed. Results: A total of 35 articles were evaluated; however, only 17 RCTs met the inclusion criteria. A total of 15 studies reported information on bone resorption, leading to a total sample of 304 implants. The estimated overall mean horizontal bone gain at the time of regeneration was 3.71 ± 0.24 mm, with 4.18 ± 0.56 mm for the block graft technique and 3.61 ± 0.27 mm for guided bone regeneration (GBR). The estimated overall net bone gain at final re-evaluation (11.9 ± 7.8) was 2.86 ± 0.23 mm. The estimated mean (± SD) resorption after 6 months was 1.13 ± 0.25 mm, with 0.75 ± 0.59 mm for the block graft technique and 1.22 ± 0.28 mm for GBR. The implant survival rate was 97% to 100%. Conclusion: Regardless of the material used for regeneration, different degrees of graft resorption should be expected. Given the sample of investigations analyzed in this review, block grafts seemed to maintain the volume of the initial augmentation site more than GBR techniques. During the initial stages of healing, the GBR technique experienced more changes compared with block grafts. The resorption of the xenograft group was inferior compared with the combination of xenograft and autologous bone groups. Consequently, overcorrection of the horizontal defects should be performed to compensate for the resorption of the grafting materials. Purpose: In this prospective study, the regenerative potential and pathways of a new injectable bone substitute (IBS) material composed of beta-tricalcium phosphate (β-TCP) and hyaluronan were investigated for its application in alveolar bone regeneration within extraction sockets. Materials and Methods: The bone substitute material was implanted in 44 extraction sockets after removal of teeth not worth preserving in the maxillary and mandibular arches of 21 patients. Four months after augmentation, bone biopsy samples were harvested simultaneously with implant placement for histologic and histomorphometric analysis of tissue reaction and determination of tissue formation (newly formed bone, connective tissue, and remaining IBS) within the augmentation bed. Furthermore, the inserted bone-level implants (C-Tech Esthetic Line) were followed up clinically and radiologically for at least 1 year after prosthetic loading to determine the potential impact of tissue reaction to the IBS on implant stability and performance. Results: The histologic and histomorphometric analyses revealed a gentle tissue reaction with mainly mononuclear and only few multinucleated giant cells within the implantation bed. Histomorphometric analysis revealed mainly newly formed bone tissue (44.92% ± 5.16%) and connective tissue (52.49% ± 6.43%). Only a few remnants of the IBS (2.59% ± 2.05%) could be found. The IBS, with its easy application and fluidity, seemed to be suitable for three-dimensional stable defects such as the intact extraction socket. Conclusion: The IBS contributed to an osteoconductive tissue reaction while undergoing a time-controlled degradation. Clinical and radiological follow-up investigation of the implants inserted in the regenerated area revealed that the IBS contributed to a long-term stable implantation bed for dental implants. The appearance of the IBS can be described as a bulk that is formed within the augmentation bed and that promotes new bone formation through an osteoconductive procedure. Zhang, Qiao / Jing, Dai / Zhang, Yufeng / Miron, Richard J. Purpose: Bone grafting materials are frequently utilized in oral surgery and periodontology to fill bone defects and augment lost or missing bone. The purpose of this study was to compare new bone formation in bone defects created in both normal and osteoporotic animals loaded with three types of bone grafts from different origins. Materials and Methods: Forty-eight female Wistar rats were equally divided into control normal and ovariectomized animals. Bilateral 2.5-mm femur defects were created and filled with an equal weight of (1) natural bone mineral (NBM, BioOss) of bovine origin, (2) demineralized freeze-dried bone allograft (DFDBA, LifeNet), or (3) biphasic calcium phosphate (BCP, Vivoss). Following 3 and 6 weeks of healing, hematoxylin and eosin and TRAP staining was performed to determine new bone formation, material degradation, and osteoclast activity. Results: All bone substitutes demonstrated osteoconductive potential at 3 and 6 weeks with higher osteoclast numbers observed in all ovariectomized animals. NBM displayed continual new bone formation with little to no sign of particle degradation, even in osteoporotic animals. DFDBA particles showed similar levels of new bone formation but rapid particle degradation rates with lower levels of mineralized tissue. BCP bone grafts demonstrated significantly higher new bone formation when compared with both NBM and DFDBA particles; however, the material was associated with higher osteoclast activity and particle degradation. Interestingly, in osteoporotic animals, BCP displayed synergistically and markedly more rapid rates of particle degradation. Conclusion: Recent modifications to synthetically fabricated materials were shown to be equally or more osteopromotive than NBM and DFDBA. However, the current BCP utilized demonstrated much faster resorption properties in osteoporotic animals associated with a decrease in total bone volume when compared with the slowly/nonresorbing NBM. The results from this study point to the clinical relevance of minimizing fastresorbing bone grafting materials in osteoporotic phenotypes due to the higher osteoclastic activity and greater material resorption. Purpose: To evaluate and compare the clinical and radiographic outcomes of mandibular rehabilitation with fixed prostheses on three implants with immediate versus delayed loading. Materials and Methods: The sample comprised 21 patients who underwent treatment with immediate loading and 23 who received delayed loading. All had worn their prostheses for at least 18 months. Radiographic evaluation of bone loss was carried out in Adobe Photoshop CS5 by a single calibrated examiner using digitized panoramic radiographs. Clinical examination of the technical conditions of the prosthetic device assessed the condition of the acrylic resin base, dental occlusion, metal framework, presence of cover screws, screw fixation of the prosthesis and abutments, length of cantilever (effort) and resistance arms, presence of plaque on prosthetic abutments, and hygiene of the prosthesis. Results: One implant failed in each group, resulting in a 95.23% treatment success rate with immediate loading and 95.65% with delayed loading (no statistically significant between-group difference). In the immediate-loading group, the mean bone loss was 1.96 ± 0.73 mm around central implants and 1.64 ± 0.84 mm at distal implants. In the delayed-loading group, the mean bone loss was 1.85 ± 0.67 mm around central implants and 1.70 ± 0.77 mm at distal implants. According to Student t test, there was no significant within-group difference in bone loss and no difference between the immediate-loading and delayed-loading groups. The only prosthesis-related complications that differed significantly between groups were "condition of the acrylic base," "occlusion," and "presence of right cover screw." There was no statistically significant association of lever arm ratio with peri-implant bone loss or bone loss on the mesial surfaces compared to the distal surfaces of the distal implants. Conclusion: The three-implant-supported fixed prosthesis protocol tested in this study proved to be a viable therapeutic strategy for mandibular edentulous patients with maxillary complete dentures, regardless of whether loading was immediate or delayed, with no difference in peri-implant bone loss. Purpose: To verify whether lateral sinus floor elevation (LSFE) with the vertical height of the osteotomy decreased to 3 to 5 mm can achieve improvement compared with a conventional lateral window in terms of implant survival, graft stability, and related complications. Materials and Methods: Of the 49 patients who were selected for inclusion in this retrospective study, 25 patients were in the test group and 24 were in the control group based on the vertical height of the lateral window. Each patient received the LSFE treatment using deproteinized bovine bone mineral (DBBM) based on the two different vertical heights of the lateral window (test group: 3 to 5 mm; control group: 6 to 8 mm in vertical height). Residual bone dimensions were measured preoperatively, and graft dimensions were measured immediately after the procedure (baseline), 6 months (T1), and 1 year (T2) postoperatively on the basis of cone beam computed tomography (CBCT) scans. CBCT scan data at the baseline were analyzed with image processing software to evaluate the volume of augmented material, and they were transformed into three-dimensional reconstruction images to calibrate the window dimension. Implant failure and recorded intraoperative and postoperative complications were counted. Results: A prominent augmented graft height was obtained in both groups (test group: 9.48 ± 3.27 mm; control group: 10.44 ± 3.01 mm) with no significant difference; likewise, no difference was observed concerning augmented graft volume. Neither cumulative survival rate (CSR) nor augmented graft height decrement had any statistical intergroup difference during each follow-up interval. CSRs were detected as 100% for the test group and 94.28% and 91.67% for the control group based on implants and patients, respectively. Intraoperative membrane perforation was reported in two cases with a few nosebleeds the first night in the test group, while one case occurred in the control group. All the perforations were successfully sealed intraoperatively by a collagen membrane. Conclusion: Osteotomy of LSFE with decreased vertical height yielded similar results to the control group with conventional dimensions in terms of implant survival, graft stability, and related complications with 1 year of follow-up. Notwithstanding, a prospective split-mouth randomized controlled trial with long-term observation is imperative to further investigate the influence of decreased vertical height of the lateral window on maturation and consolidation of DBBM. Purpose: To compare intrabony thermal changes induced by two different protocols for guided implant surgery during the whole drilling procedure. Materials and Methods: Two protocols for guided implant placement were evaluated in vitro using artificial bone cylinders. The control protocol provided traditional metal sleeves and a standard drilling sequence composed of four cylindrical triflute drills (cutting surface length = 16 mm). The test protocol provided a three-slot polyurethane sleeve and two cylindrical drills (second drill cutting surface length = 4 mm). Forty automated intermittent and graduated osteotomies (depth = 14 mm) were performed under external irrigation. Temperatures were measured in real time by three sensors at different depths (2, 8, and 13 mm). The temperature changes generated by the final drill of each protocol during the shearing and withdrawing processes were recorded as experimental results and subjected to the Student t test. Results: Maximum temperature increases were recorded during the process of withdrawing in both protocols. In the control group, the mean thermal changes were 10.18°C, 8.61°C, and 5.78°C at depths of 2, 8, and 13 mm, respectively. In the test group, the mean thermal changes were 1.44°C, 4.46°C, and 3.58°C at depths of 2, 8, and 13 mm, respectively. The control group revealed statistically significantly (P < .0001) higher thermal changes than the test group, both in the superficial and deeper bone areas. Conclusion: An appropriate irrigation system could be crucial for thermal lowering during a guided implant osteotomy mainly in the coronal and middle third of the implant site. Copious irrigation should be provided during the withdrawing process since greater thermal increases could be expected. Lower temperature increases could be achieved, reducing drill-to-bone contact, ie, cutting surface length, due to short frictional force exposure. Purpose: New digital technologies enable real-time computer-aided (CA) three-dimensional (3D) guidance during dental implant surgery. The aim of this investigational clinical trial was to demonstrate the safety and effectiveness of a prototype optoelectronic CA-navigation device in comparison with the conventional approach for planning and effecting dental implant surgery. Materials and Methods: Study participants with up to four missing teeth were recruited from the pool of patients referred to the University of Toronto Graduate Prosthodontics clinic. The first 10 participants were allocated to either a conventional or a prototype device study arm in a randomized trial. The next 10 participants received implants using the prototype device. All study participants were restored with fixed dental prostheses after 3 (mandible) or 6 (maxilla) months healing, and monitored over 12 months. The primary outcome was the incidence of any surgical, biologic, or prosthetic adverse events or device-related complications. Secondary outcomes were the incidence of positioning of implants not considered suitable for straightforward prosthetic restoration (yes/no); the perception of the ease of use of the prototype device by the two oral surgeons, recorded by use of a Likert-type questionnaire; and the clinical performance of the implant and superstructure after 1 year in function. Positioning of the implants was appraised on periapical radiographs and clinical photographs by four independent blinded examiners. Peri-implant bone loss was measured on periapical radiographs by a blinded examiner. Results: No adverse events occurred related to placing any implants. Four device-related complications led to a switch from using the prototype device to the conventional method. All implants placed by use of the prototype device were in a position considered suitable for straightforward prosthetic restoration (n = 21). The qualitative evaluation by the surgeons was generally positive, although ergonomic challenges were identified. All study participants were present for the 1-year examination (n = 20 patients, 41 implants, 32 superstructures), and no complications or failures with any implants or superstructures were revealed. The peri-implant bone loss was less than 1 mm for all implants. Conclusion: Within the limitations of this trial, the prototype device provided placement of dental implants without adverse events. Purpose: The purpose of this study was to create three-dimensional composite models of quad zygomatic implant-supported maxillary prostheses with a variety of alveolar bone defects around implant sites, and to investigate the stress distribution in the surrounding bone using the finite element analysis (FEA) method. Materials and Methods: Three-dimensional models of titanium zygomatic implants, maxillary prostheses, and human skulls were created and assembled using Mimics based on microcomputed tomography and cone beam computed tomography images. A variety of additional bone defects were created at the locations of four zygomatic implants to simulate multiple clinical scenarios. The volume meshes were created and exported into FEA software. Material properties were assigned respectively for all the structures, and von Mises stress data were collected and plotted in the postprocessing module. Results: The maximum stress in the surrounding bone was located in the crestal bone around zygomatic implants. The maximum stress in the prostheses was located at the angled area of the implant-abutment connection. The model with anterior defects had a higher peak stress value than the model with posterior defects. All the models with additional bone defects had higher maximum stress values than the control model without additional bone loss. Conclusion: Additional alveolar bone loss has a negative influence on the stress concentration in the surrounding bone of quad zygomatic implant-supported prostheses. More care should be taken if these additional bone defects are at the sites of anterior zygomatic implants. Antonoglou, Georgios N. / Stavropoulos, Andreas / Samara, Maria D. / Ioannidis, Alexis / Benic, Goran I. / Papageorgiou, Spyridon N. / Sándor, George K.
Purpose: The purpose of this systematic review was to assess the survival of implants placed in augmented sinuses on a medium- to long-term basis, and identify factors affecting implant survival such as surgical technique, bone grafts, and timing of implant placement. Materials and Methods: A literature search up to July 2016 was performed to identify prospective clinical studies on sinus floor augmentation in conjunction with implant placement with a minimum follow-up of 3 years. Meta-analytic methods were implemented to calculate implant survival rates and relative risks (RR) for failure and the effect of surgical technique, use of bone graft, graft type, use of membrane, mean residual bone height, and timing of implant insertion. Results: A total of 17 clinical trials (1 randomized and 16 prospective nonrandomized) were included, which pertained to 637 patients (at least 48% male) and 1,610 implants placed after sinus floor augmentation with the osteotome (transalveolar) or lateral window approach. The pooled implant survival rate at 3 to 6 years of follow-up was 97.7% (17 studies; 95% CI = 94.4% to 99.7%) with high heterogeneity. Smoking was associated with significantly worse implant survival (2 studies; RR = 4.8; 95% CI = 1.2 to 19.4; P < .05). However, evidence of influencing factors varied from very low to moderate after adopting the GRADE approach, due to risk of bias, imprecision, inconsistency, and small-study effects. Conclusion: Current evidence suggests that implants in augmented sinuses have high survival rates, with smoking playing a potentially important negative role in their prognosis. Both indirect and direct maxillary sinus floor augmentation seem to have a low frequency of manageable complications. Zygomatic implant site preparation could be considered a challenging procedure because of the use of a very long twist drill that could sometimes be difficult to control due to the need for drilling the malar bone on an oblique surface. Ultrasound was recently suggested to achieve better control, but the specific long tips required are not readily available, and the elongated tip also tends to reduce the efficacy. This technical note describes a proposal of a novel computer-aided technique to simplify the procedure of zygomatic implant site preparation. This method uses a standard-length ultrasonic tip to prepare the crestal bone and the zygomatic bone in two individual steps. The desired implant trajectory can be achieved during preparation using a real-time tracking navigation system. The combined use of the navigation system and the ultrasonic tips could aid the surgeon, during the first steps, in achieving optimal control of the instruments employed for the implant site preparation and keeping the planned zygomatic implant position. If the efficacy of the procedure is confirmed through clinical trials, this technique could also contribute to reducing the invasiveness of the procedure, promoting a smaller flap, and reducing the soft tissue damage. Dental implants positioned in severely atrophied anterior maxillae require esthetic or functional compromises. This case report describes the rehabilitation of a severely atrophied alveolar ridge with a three-dimensional (3D) computer-aided design/computer-aided manufacture (CAD/CAM) surgical guide. A 50-year-old woman had a severely atrophied anterior maxilla with unfavorably positioned dental implants. Functional and esthetic prosthodontic restoration was difficult to achieve. An anterior segmental osteotomy was planned to reposition the dental implants. A 3D surgical guide was designed for precise relocation of the segment. The surgical guide firmly grasped the impression copings of the dental implants, minimizing surgical errors. Three-dimensional gingival simulation was used preoperatively to estimate the appropriate position of the gingiva. Rigid fixation to the surrounding bone allowed immobilization of the implant-bone segment. Satisfactory esthetic and functional outcomes were attained 6 months after surgery. Finally, a severely atrophied alveolar ridge with unfavorably positioned dental implants was recovered with minimal esthetic and functional deterioration using gingival simulation and a 3D CAD/CAM surgical guide. Purpose: To investigate whether human adipose-derived stem cells will form a functional bone-like matrix on titanium substrates. The behavior of human adipose-derived stem cells was examined when grown in either serum-free, xeno-free stem cell growth medium or osteogenic differentiation medium and cultured on either machined titanium (MTi) or on roughened alumina-blasted titanium (ABTi) discs. Materials and Methods: Cellular proliferation, extracellular mineralized matrix production, osteogenic-related protein production (RUNX2 and osteocalcin), and gene expression for pluripotency and self-renewal (TERT and OCT4) and osteogenic-related (MSX2, RUNX2, and BGLAP) genes were performed. Results: Human adipose-derived stem cells in serum-free medium (hADSC) proliferated at a higher rate compared with osteogenically differentiated cells (hOS-ADSC); however, the osteogenically committed cells produced more mineralized matrix on the titanium surfaces compared with either tissue culture plastic or the undifferentiated cells. The immunofluorescence analysis showed that human adipose-derived stem cells cultured in serum-free medium and osteogenic differentiation medium produced RUNX2 on both the machined titanium surface and on the alumina-blasted titanium surface after 7 days in culture. Only osteogenically differentiated cells produced osteocalcin after 21 days. Relative gene expression showed stable expression of MSX2, RUNX2, and BGLAP over time on all surfaces. Only osteogenically differentiated cells displayed osteogenic characteristics over time. Conclusion: This study confirmed that human adipose-derived stem cells could be successfully grown in serum-free, xeno-free culture medium suitable for clinical use. Adipose-derived stem cells thus show potential utility for bone regeneration in association with titanium surfaces.